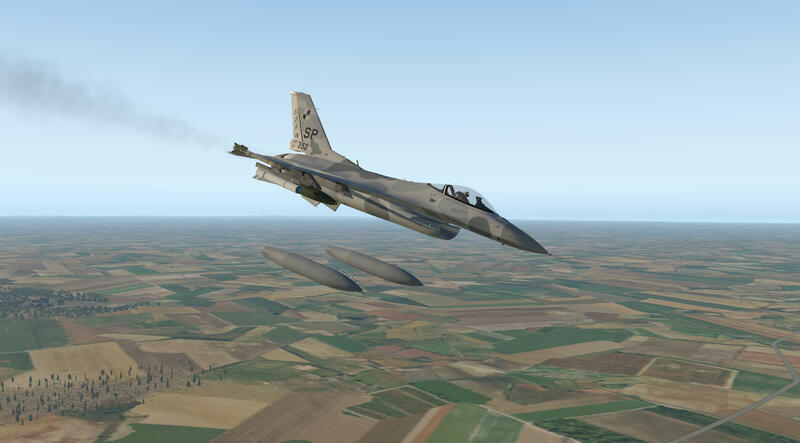 You can’t miss it ….. “The F-16 remains the world’s most successful, combat-proven multirole fighter. Approximately 3,000 operational F-16s are in service today in 25 countries” ….. the first statement from the dedicated Lockheed Martin F-16 Falcon webpage. Over 4,500 aircraft have been built since production was approved in 1976. Although no longer being purchased by the U.S. Air Force, improved versions are being built for export customers. In 1993, General Dynamics sold its aircraft manufacturing business to the Lockheed Corporation, which in turn became part of Lockheed Martin. 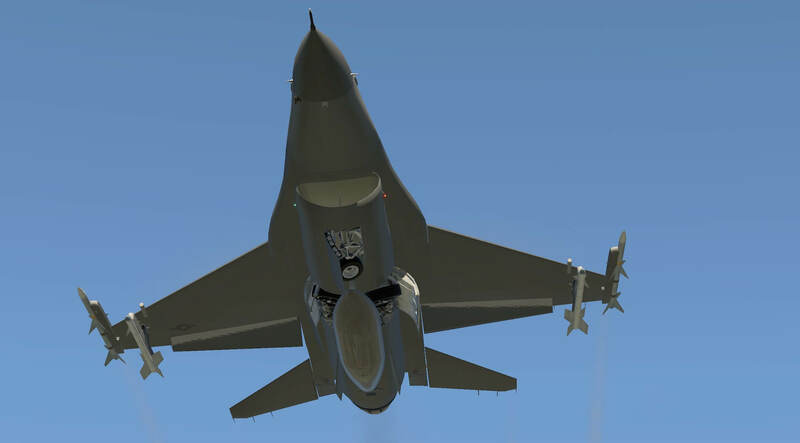 The Fighting Falcon’s key features include a frameless bubble canopy for better visibility, side-mounted control stick to ease control while maneuvering, an ejection seat reclined 30 degrees from vertical to reduce the effect of g-forces on the pilot, and the first use of a relaxed static stability/fly-by-wire flight control system which helps to make it a nimble aircraft. 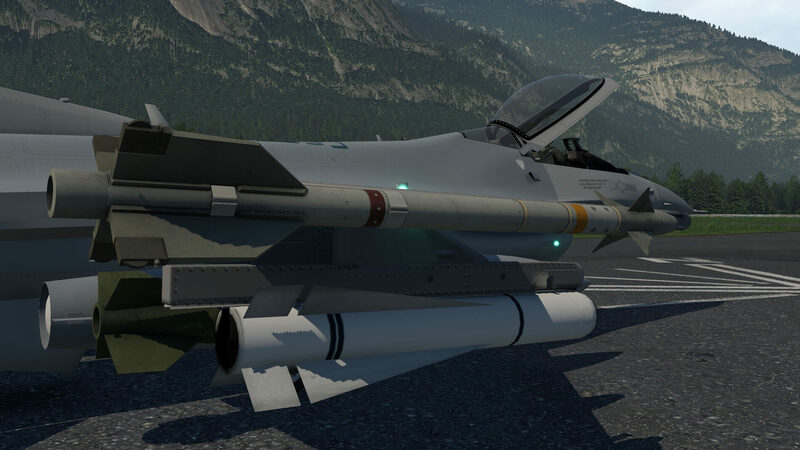 The F-16 has an internal M61 Vulcan cannon and 11 locations for mounting weapons and other mission equipment. 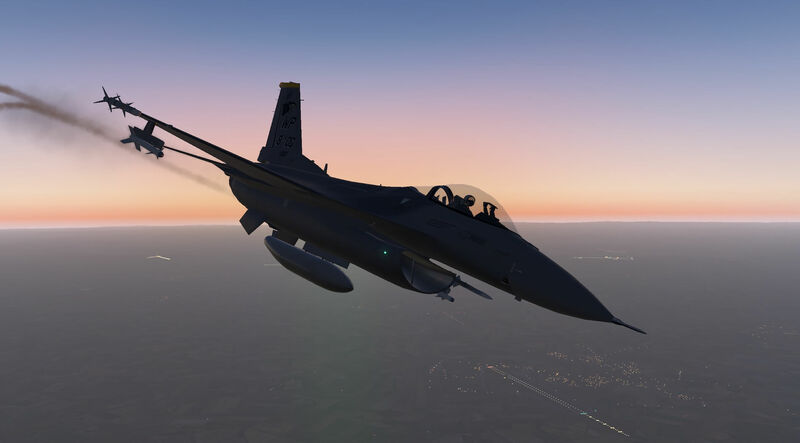 With such a famous fighter, you can expect that there’s so much more dedicated F1-6 information on the Web, so search for “F-16”, “Viper” or “Flighting Falcon” and tons of interesting data comes available. The prototype was built at Fort Worth, Texas, the prototype rolled out 13 December 1973. It was loaded aboard a Lockheed C-5A Galaxy heavy-lift transport and was flown to Edwards. During high-speed taxi tests on 20 January 1974 the YF-16 began to oscillate in the roll axis, threatening to touch the wingtips to the ground. To prevent damage, Phil Oestricher lifted off to regain control and after six minutes, touched down again. The airplane had sustained damage to the right horizontal stabilizer. Engineers determined that the airplane’s roll control was too sensitive, and that the exhaust nozzle was improperly wired, resulting in too much thrust at low throttle settings. 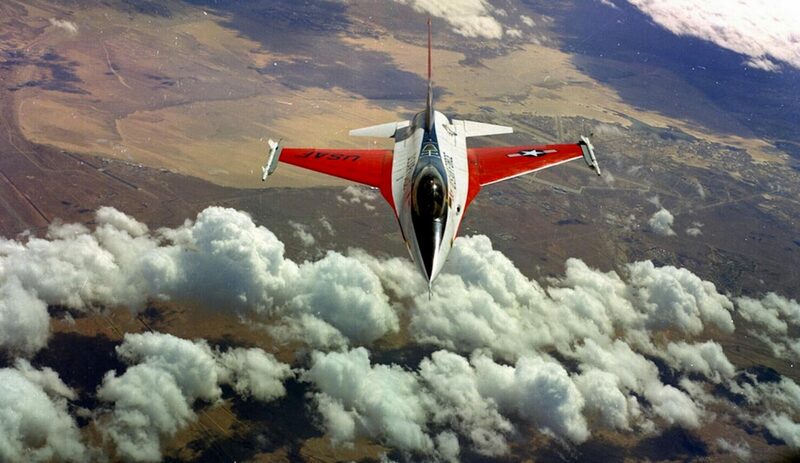 The YF-16 was repaired and was ready for its first test flight on 2 February. 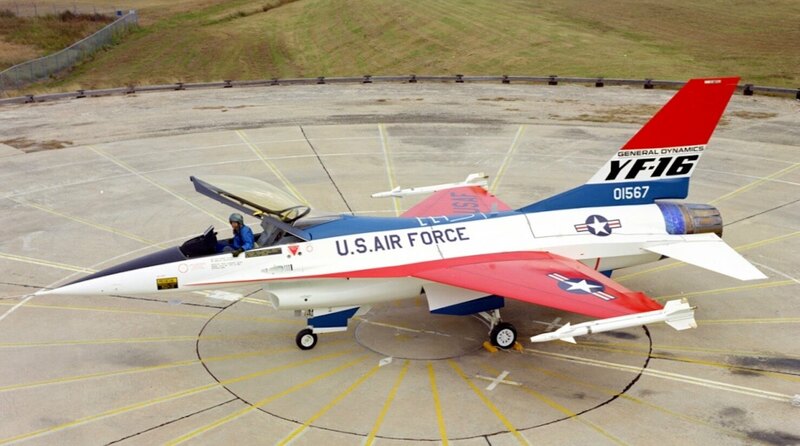 The first prototype YF-16, 72-1567, is now on display at the Virginia Air and Space Center, Hampton, Virginia. (Courtesy of This Day in Aviation). The installation process is easy and straightforward. 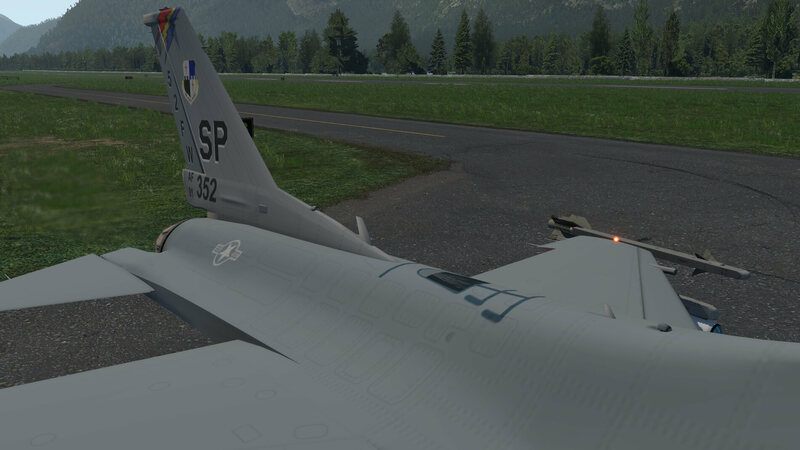 Download the package from X-Plane.Org, unzip it and copy and paste the folders into the X-Plane 11 Aircraft folder. 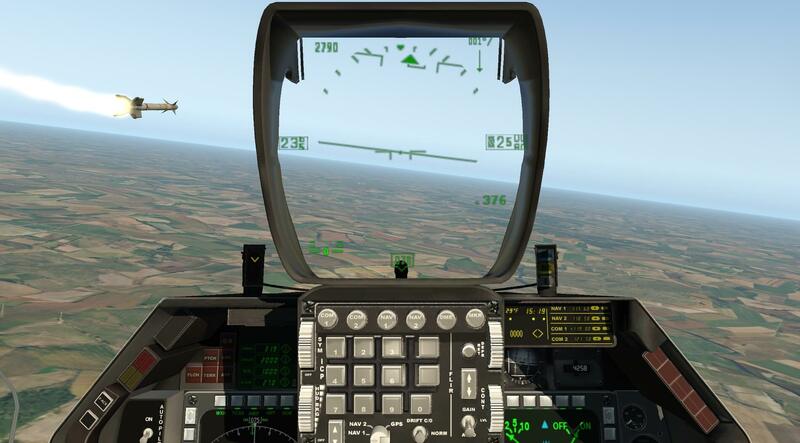 If you prefer, you can also create under the Aircraft a subfolder “JCS” or “JCS X-Aerodynamics”. This could be an idea when you own more JCS aircraft. 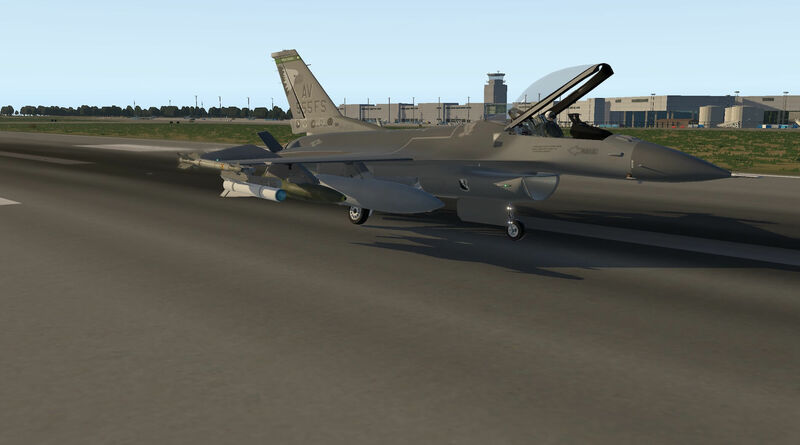 As a side note I would like to highlight that the modeled fighter is the F-16C. On the other hand, the manual talks about the loadout options “gun only”, “ferry (3 external fuel tanks”, “air-to-air” and “ground attack”. 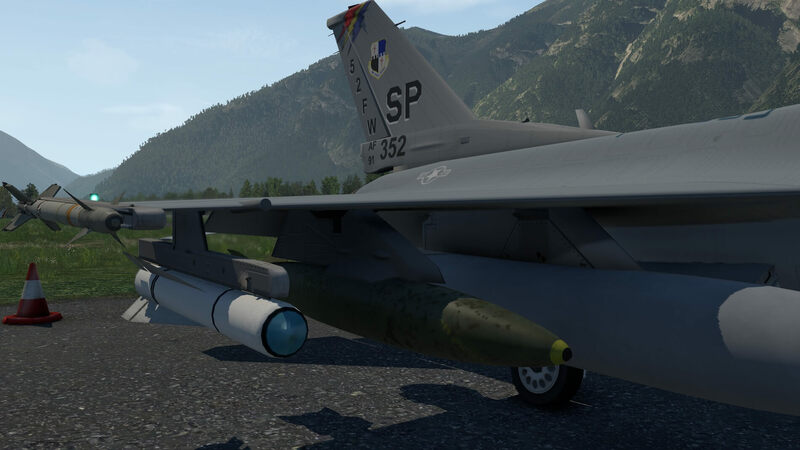 To prevent any confusion, I’ve added the JCS F-16 manual options behinds the packages name. 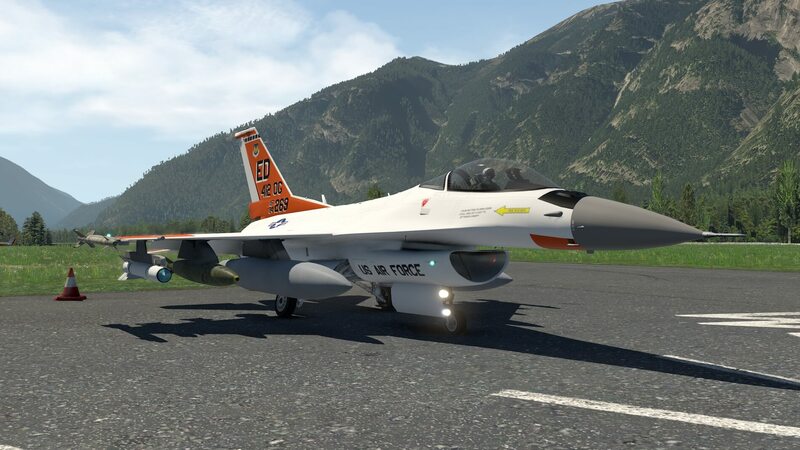 The modeled F-16 comes in total with 12 liveries or actually 13 since number 13 is the default painting. I know that the YF-16 isn’t the modeled fighter, but I had hoped that JCS/X-Aerodynamics had also included in the package the original factory painting as you have seen on the photo’s in the previous section. While writing this, I’m wondering if there’s a paint kit included, but must conclude that there’s no paint kit available “yet”. Worth the information, the whole F-16 exterior is painted on a 2K sheet. Perhaps a 4K was an idea which gives painters the possibility to add more details and talking about details. More about that during my external inspection. 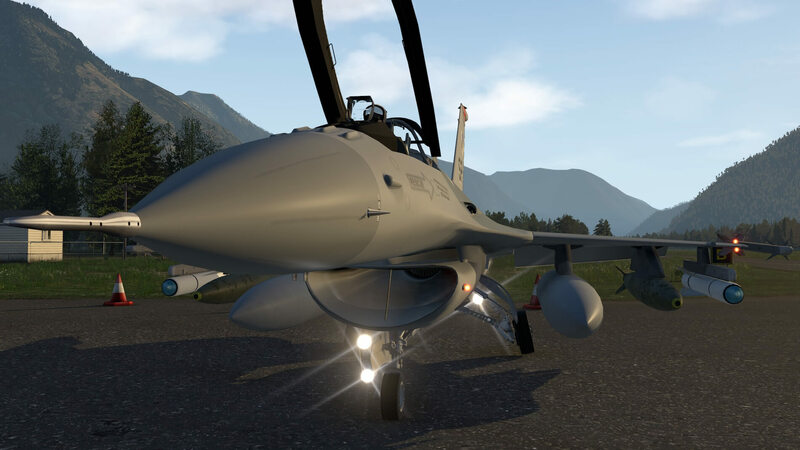 The package comes with a F-16 manual that covers most of it although a bit more in-depth information about the systems and what is and what isn’t simulated would be welcome. One thing Andy Clarke came up is the “weapons” MFD image on page 15. That’s something that isn’t available in this aircraft. For weapons and so on, you need to focus on the MFD weapons image on page 24. In the F-16 manual you’ll notice that several switches or knobs aren’t discussed. They are not highlighted in the manual because they aren’t simulated so they have no function. The manual explains every panel, but it would be welcome when there was also a tutorial although the manual covers the aircraft start-up and take-off configuration. All together it’s a bit limited information. That said, I hope that updates will not only include model fixes and improvements, but also an updated “more informative” manual. 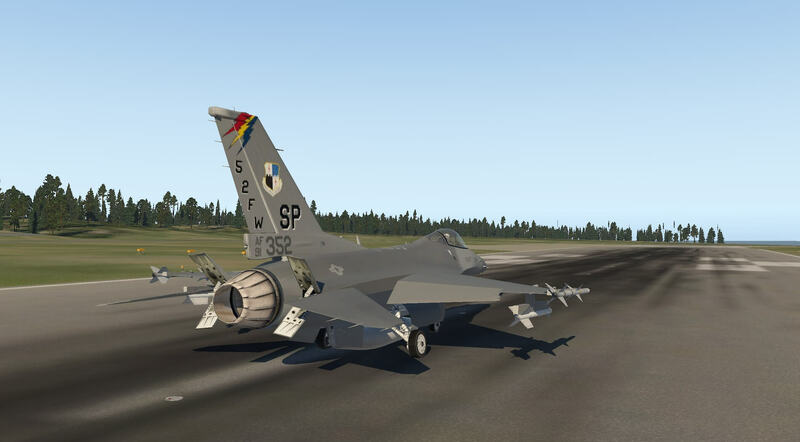 A part of the configuration is the choice you have which F-16 you would like to fly. I discussed this before; you either go for a ferry-, clean-, air-to-air or ground attack model. The reason I highlight these sentences is for everybody important. For us as reviewers we know that the model is as accurate made, but no tested with real pilots or that systems not always fully reflect the reality. For Angelique’s overall impression, she first checks the internal, followed by a thorough external inspection. Angelique continues; when jumping into the modeled cockpit, there’s one thing I noticed …. not all switches you see are functional. Not really a problem although in these days you may expect that all switches have a function unless it’s difficult to get ll the inside information what everything is or should do. The other thing I noticed is that not all indications you see in the cockpit, either old-fashioned indicators/instruments or DUs (Display Units), are sharp. 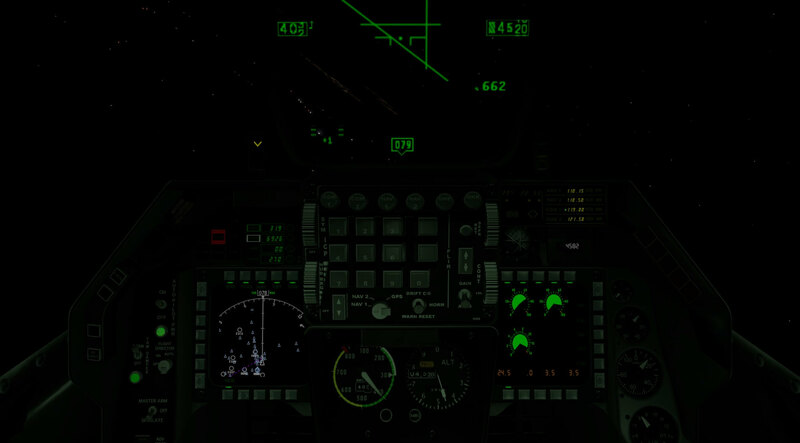 Some of them are a bit blurry, in particular the MFD’s (Multi Function Displays) and the HUD (Head Up Display). Before I wrote this down, I double checked it for myself with other X-Plane 11 fighters and I think it is possible to make sharper instruments and/or DUs. I sincerely hope that with future updates the developers are able to make these things sharper. 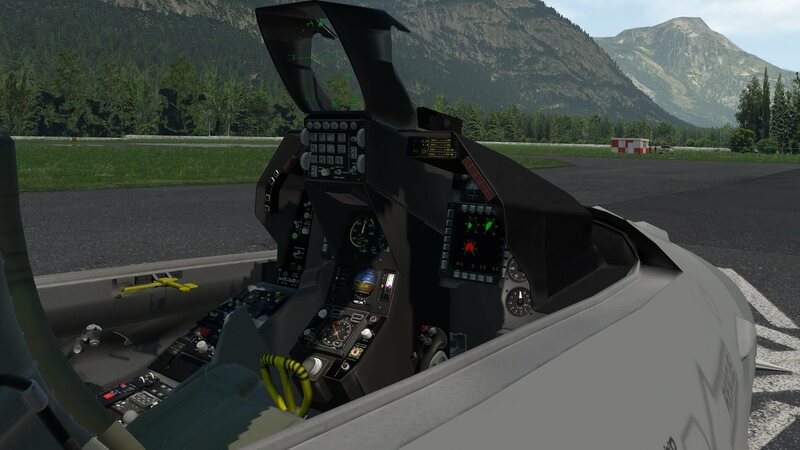 The modeled 3D cockpit gives you a good idea how it is to sit in F-16 cockpit. Typical for the F-16, the sidestick on the side, and the throttle lever. All positioned in a way that even with hi-G forces, the pilot is always able to move either the stick or the throttle. 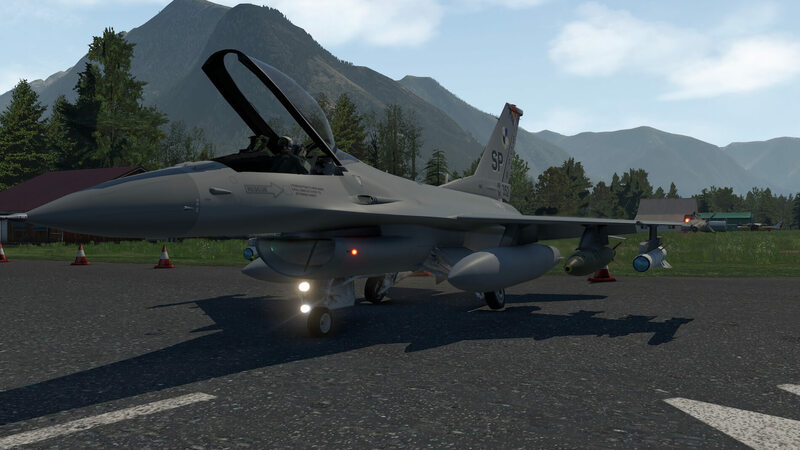 The F-16 is already an old fighter, which will be replaced or is already replaced by the F-35 and therefore, I had hoped that the internal wall textures, floor panel textures and others showed a bit more “weathering” look and feel. I feels a bit “too” clean. 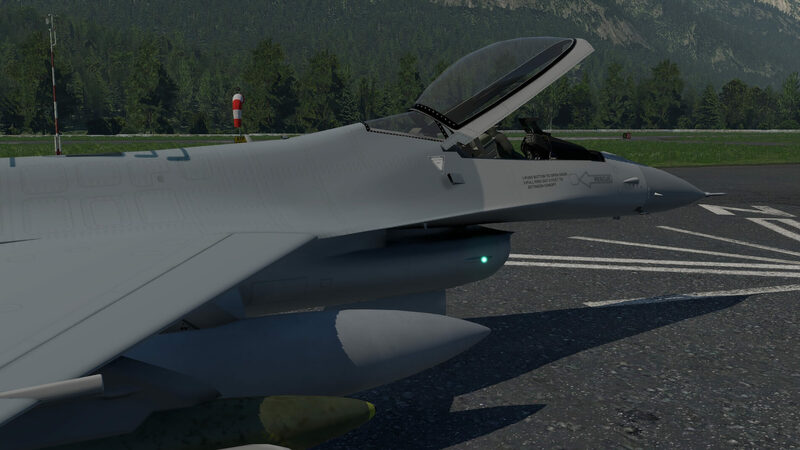 And of course, it;’s also a matter what the developer or painter likes, but knowing the age of the F-16, I had hoped for a more “used” cockpit. Most of the “switch” text on the panels is OK. You can read it, but it’s not that I say it’s razor sharp. 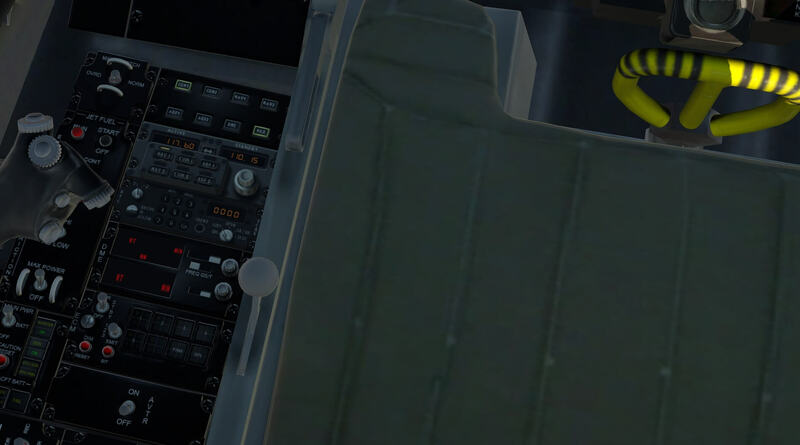 For example, on the right-hand console you see a MCDU which is blurry and not even sure if it was mounted in the real F-16, but blurry as this unit is, there’s no need for. All together a nice cockpit with some improvements to do. 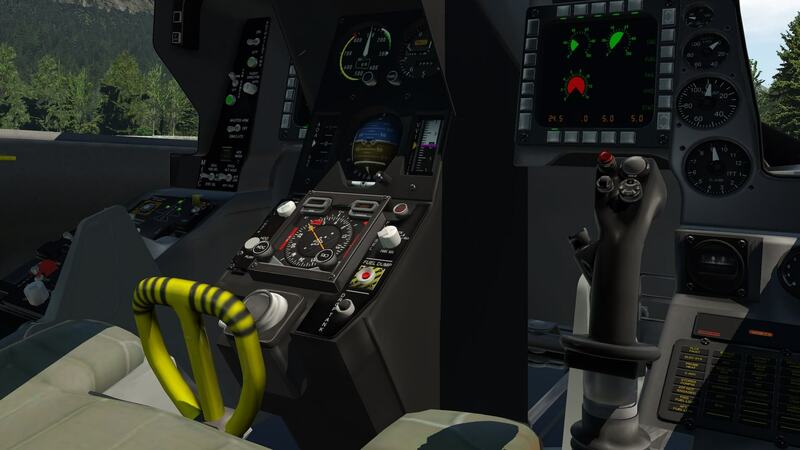 Andy will cover a bit later in this review the system simulations and functionality. 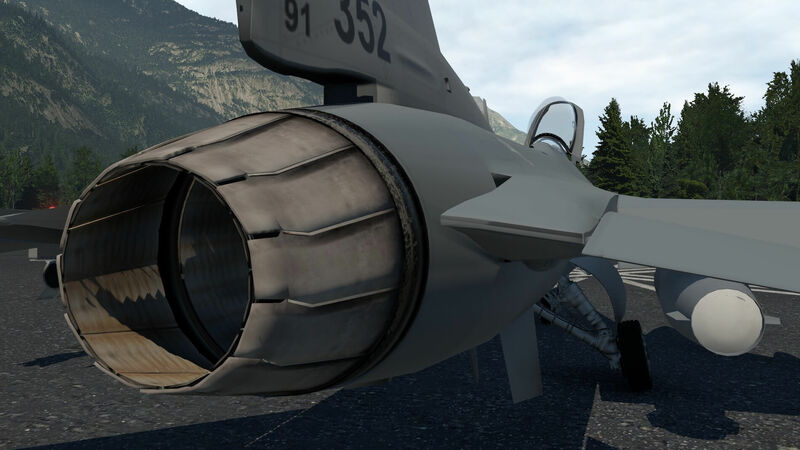 For me, it’s time to check the outside of the modeled F-16. But first, I need to open the canopy. Move you mouse to the yellow handle/lever on the left-hand side console and the mouse “should” turn into a hand that allows you to click which will result in the canopy to open. It opens, but I wrote “should” turn into a mouse, what didn’t happen on my Mac. More information about the canopy opening/closing procedure can be found in the manual page 23. 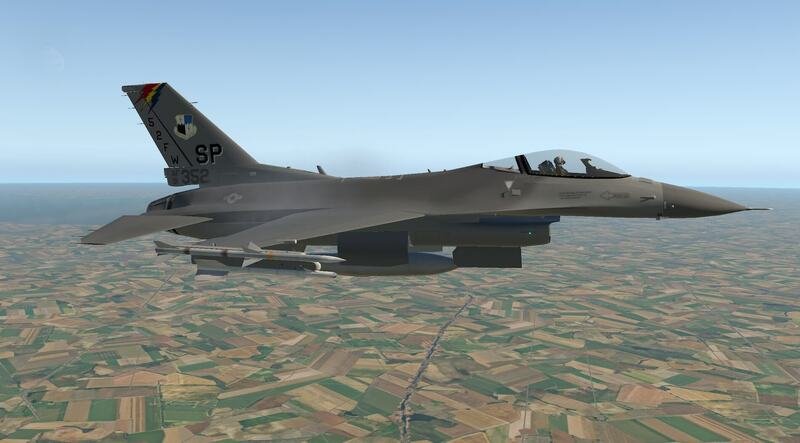 The modeled F-16 is without doubt a General Dynamic s F-16. It comes with a couple of paintings. From a distance the F-16 looks very well. 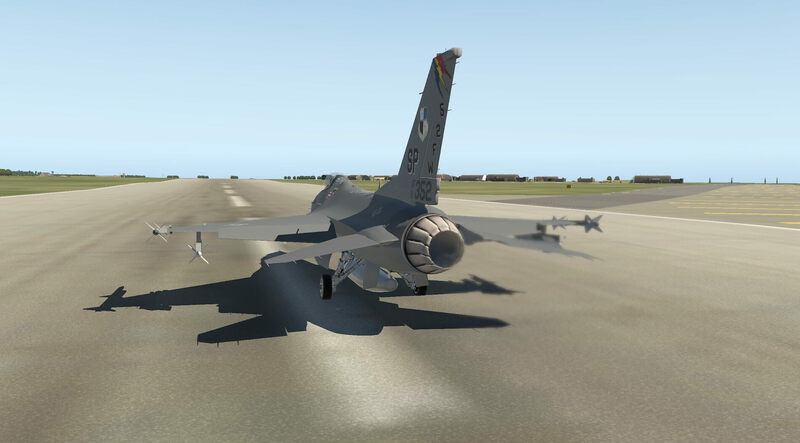 A well modeled part of the F-16 is the landing gear. It’s a bit clean, but a lot of time and effort is put into it to give it a great view. 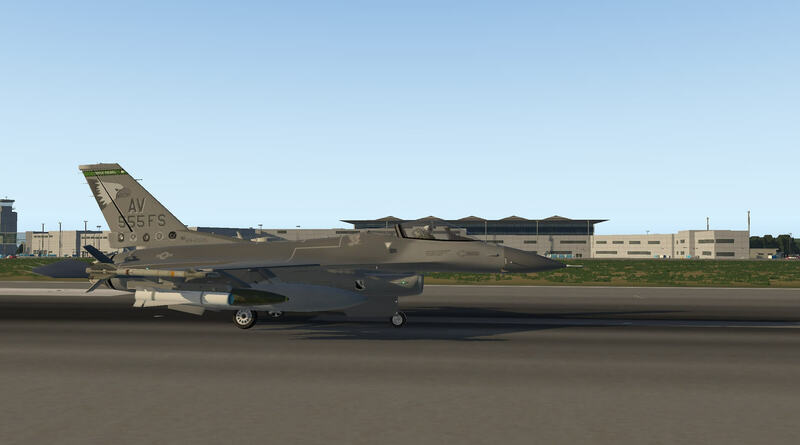 That the F-16 should have a clean skin makes sense, right, but on the other hand, the upper fuselage skin has lots of panels which are mostly screwed and some of them have hinges. That said, you will see some of these simulated panels and skin lines with tampered lighting conditions. That’s not really the case with the textures that are included. Panels and Alu skin lines are only drawn on the texture sheet, but I miss the NML or 3D effect. More about that in a second. 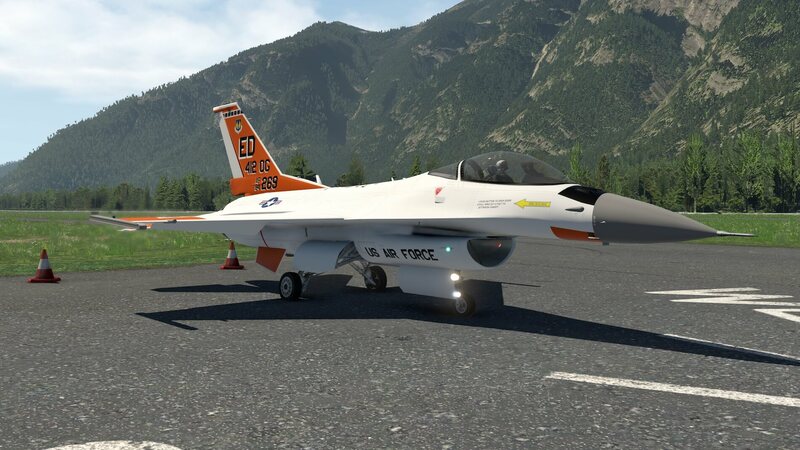 All paintings or liveries that are included are representing a brand-new F-16 or they all have had recently a heavy maintenance including a fresh paint. Anyway, I had hoped also for some “used” paints, but that’s a personal taste. 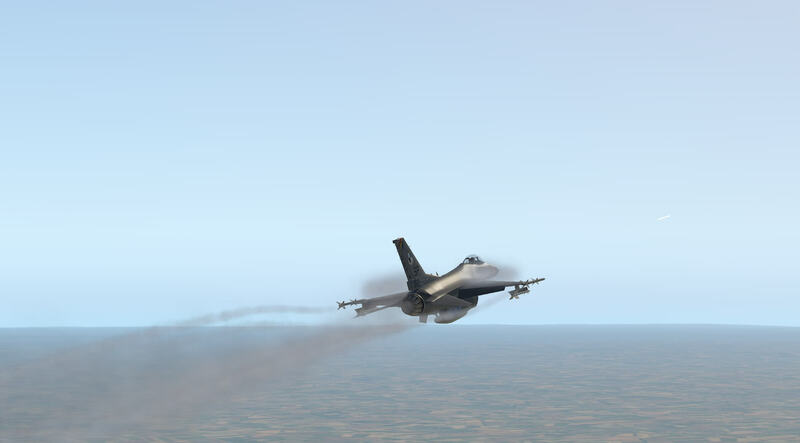 The screenshots from this F-16 represent a dull paint, which is in most of the cases correct. 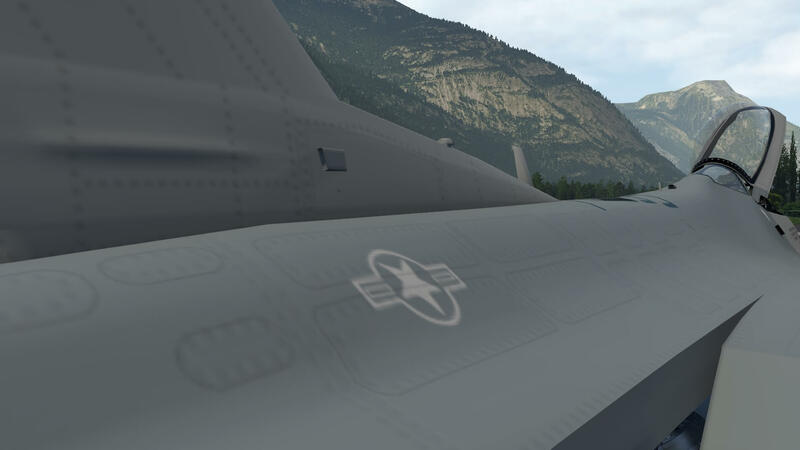 But when you look closely to the screenshots, you can see some panel markings. Not really sharp, but they are their although I’ve got the impression that some marking or panels with and without hinges are missing. Also the skin panels aren’t clearly visible. If this could be improved with future updates, I don’t know. 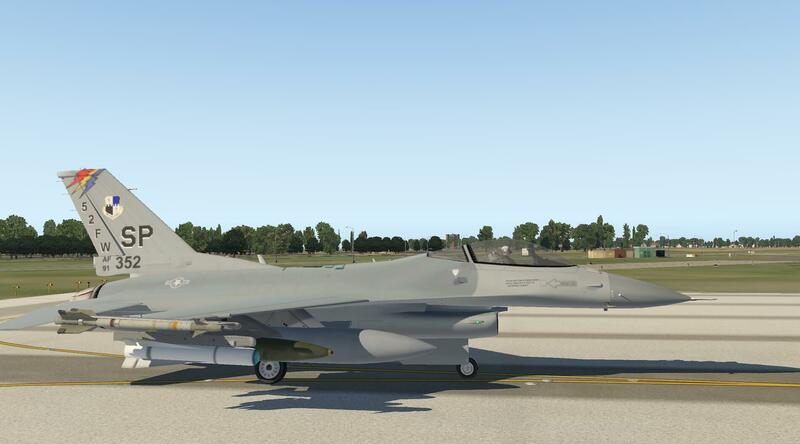 I looked in the objects folders of each F-16 model, but couldn’t find a F16_exterieur NML (Normal Mapping file). Unless I’m wrong, but with a NML file you can add a 3D effect to the texture, in this case for the external texture files. I mentioned it before, I’m pleased to see how much work is put into the creation and accuracy of gears and wheels. For some reason the engine exhaust looks gorgeous. It’s modeled with great precision and looks realistic. 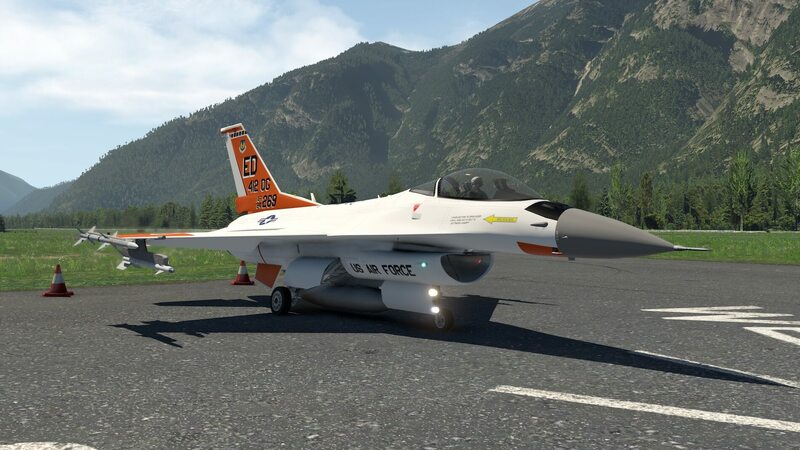 If it is possible that somebody, preferable of course the stock painter, can create fuselage NML files and improve the slightly blurry look of the panels, text and even logo on the F1-6 skin/tail, that would be awesome. 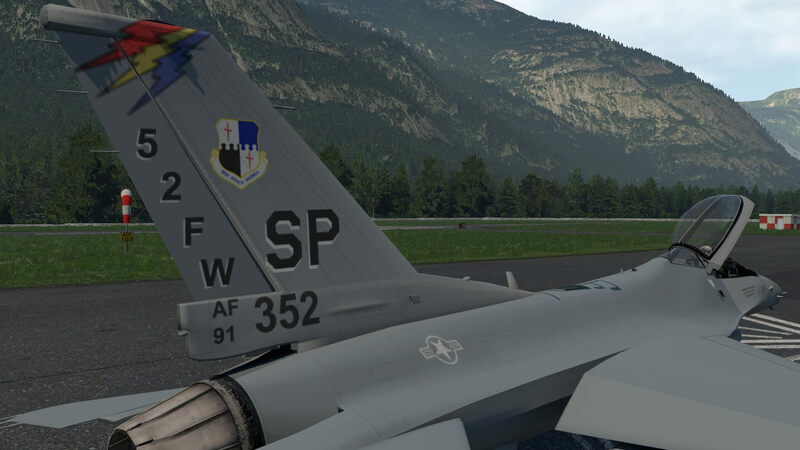 As far as my paint knowledge goes, it won’t be an easy job since the previous mentioned F16_exterieur texture file is only 2K while 4K had been a much better choice and allows painters to make a great and sharp livery. The sales information for the model focussed on the engine sounds supplied. This of a high quality and produces an accurate response to throttle movements. The engine sounds range from a quiet hum at start up to a full throated roar on increased throttle. The avionics also produce their own sounds and can be clearly heard at engine start before being covered by the engine noise. The engine sounds different from inside and outside of the aircraft. These are not the only sounds provided and use of the model is accompanied by many other realistic noises such as foot pedal movement, some switches and levers and ground noise. Alarms and verbal warnings are loud and clear! I have never flown in an F16 but I was surprised to find there was no sound to accompany missile release but the guns can clearly be heard. This model does not perhaps have as comprehensive a sound package as others, indeed it does not claim to have, but there is more to it than the sales information may suggest and those that are provided are of good quality and realistic. 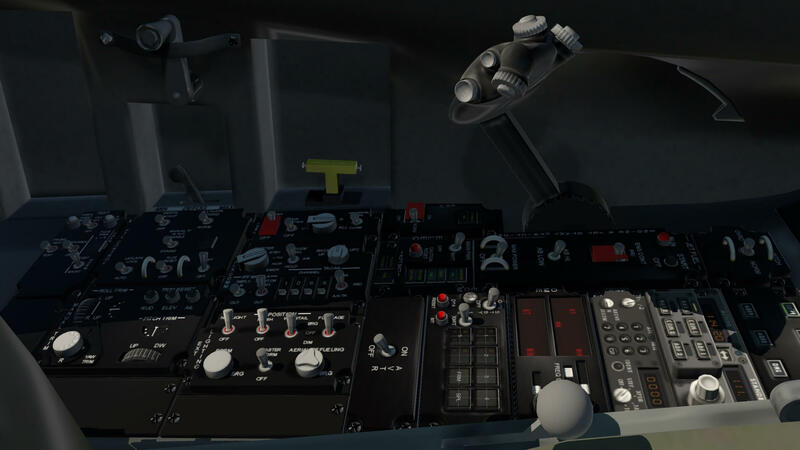 Not all systems are modelled in the aircraft but those that are created are particularly relevant to the flying experience and do add realism for the user. 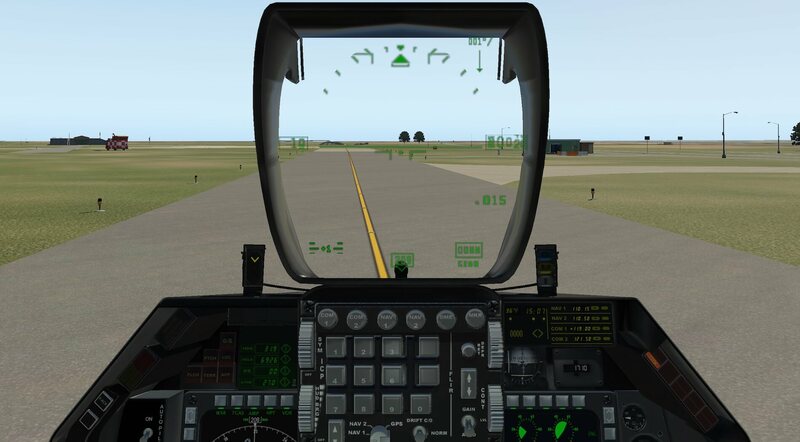 The Head Up Display is modelled to provide a range of information to the pilot and, as in the real world, once the user knows where to look that information is useful and it avoids having to look away from flying the aircraft. The text and symbols would benefit from being a little clearer and crisper at times but they respond well to changes in the circumstances of the aircraft and keep the pilot well informed. 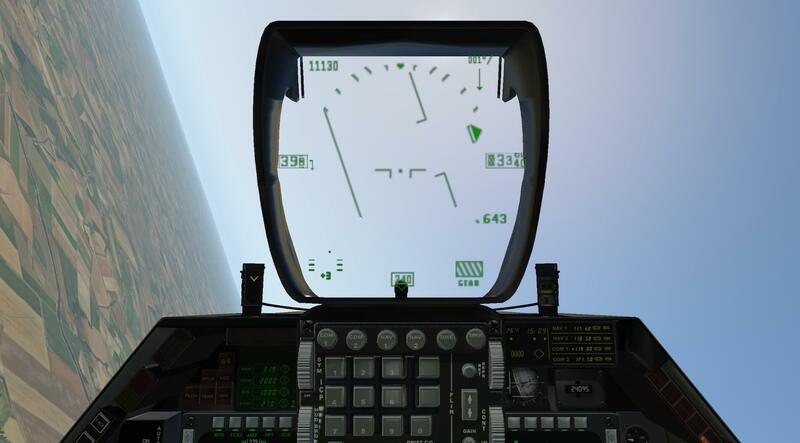 The display creates an artificial horizon in the main screen whilst information relating to vertical speed, altitude, airspeed, G, Mach number, speed brake, landing gear and heading appears around the edge of the display in digital and graphic forms. 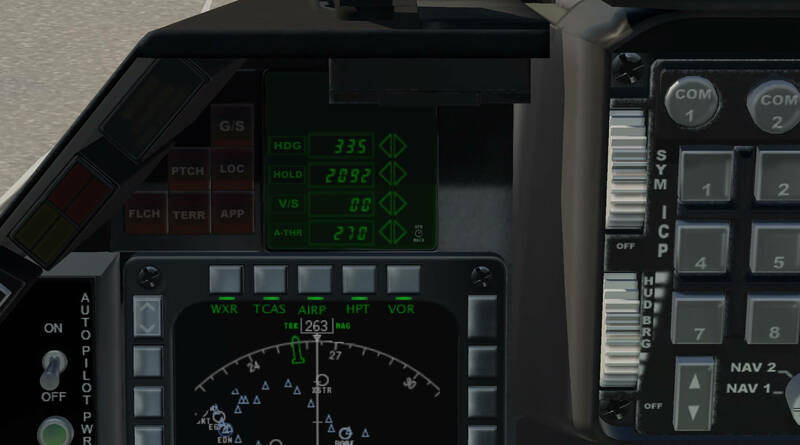 Alongside the display, and easily viewed by the pilot, there is an Angle of Attack Cue and a Radio Markers Indicator informing the user of when the marker beacons relating to an approach have been passed. 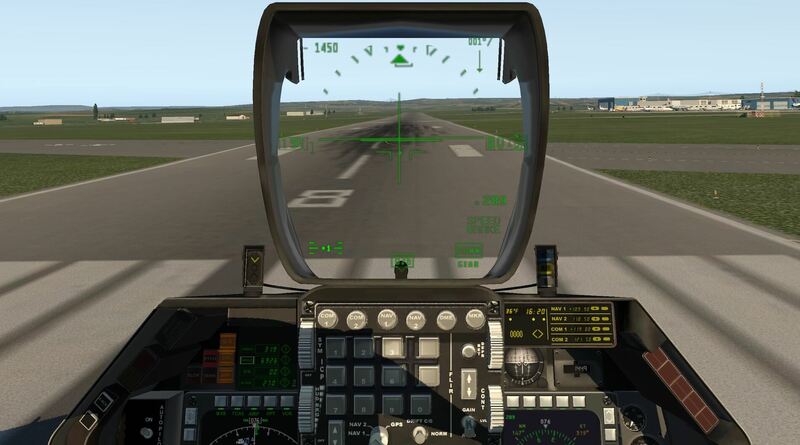 The HUD is a useful piece of equipment and becomes easier and more instinctive to use with practice. The information provided is backed up by more conventional instrumentation elsewhere in the panel. The model is also equipped with two Multi Function Displays which provide further information to the pilot. 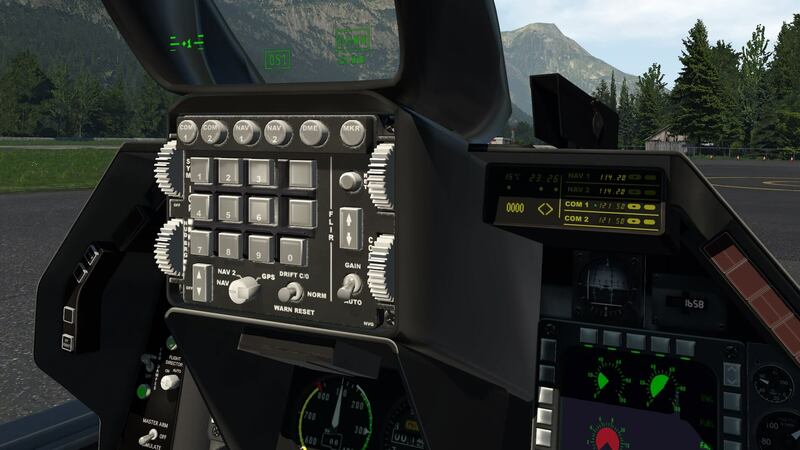 Buttons around the edge of the displays allow the user to control the information displayed and this can relate to engine information and data, map information, weapons and navigation updates. The map can also display, or not display, differing information such as airfields, weather and navigational aids and can be zoomed in and out dependent on pilot input. 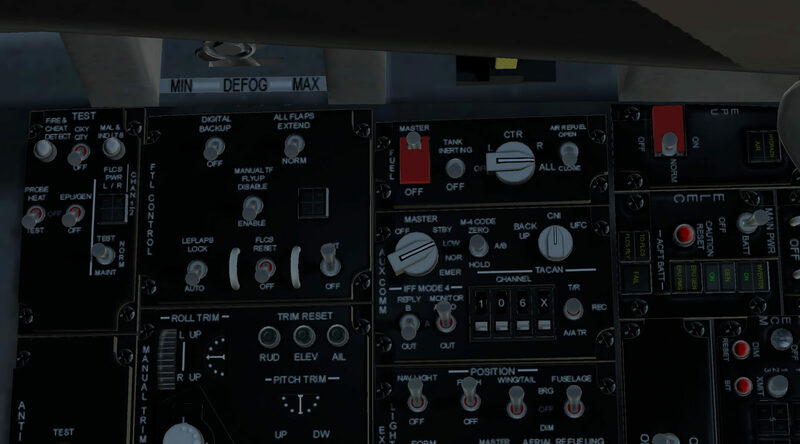 The map will also display routes input into the X-Plane FMS although, as in the real thing, the route does not control the autopilot and needs some human interaction for the aircraft to fly the intended path. 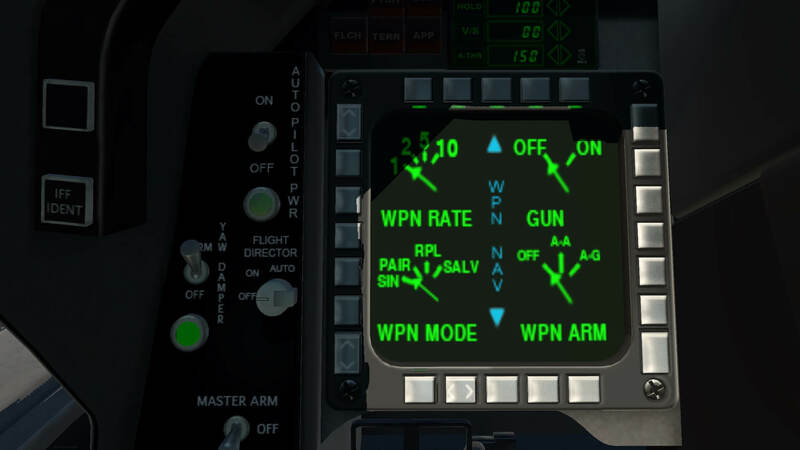 The weapons page illustrated in the manual is now out of date and a more interactive touch screen can be displayed which allows the pilot to arm and disarm the guns and set air to air or air to ground weaponry to armed. The manual suggests binding a button for the “fire guns” command and another for the “ fire selected weapon” command. 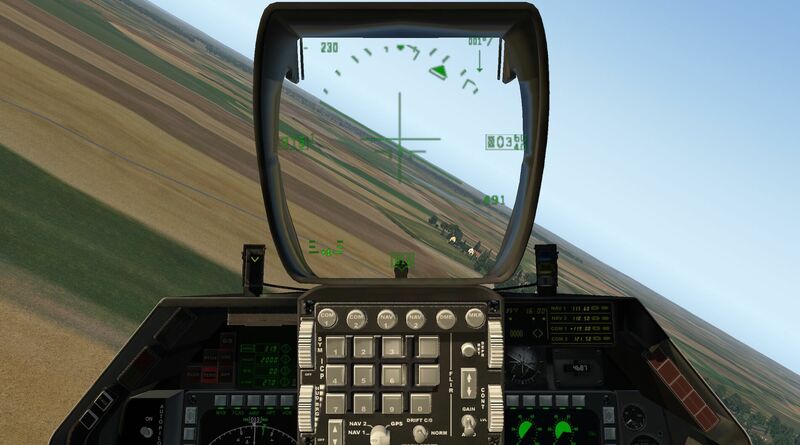 When the aircraft is loaded with multiple air to ground or air to air weaponry it is not yet possible to select which of those weapons is given priority to fire although the weapons screen does provide a choice as to how many are fired at once. 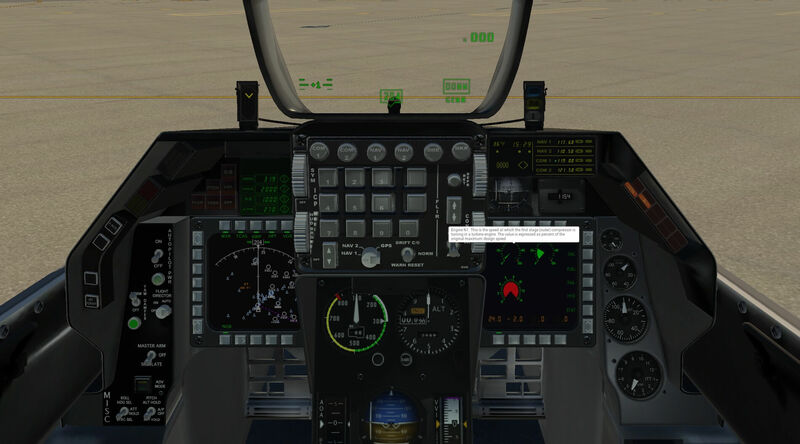 These screens, like in all models, take a bit of practice so that the pilot knows what information is available and where to look for it but they do create a realistic environment and give the user a lot of help, and a lot to think about. 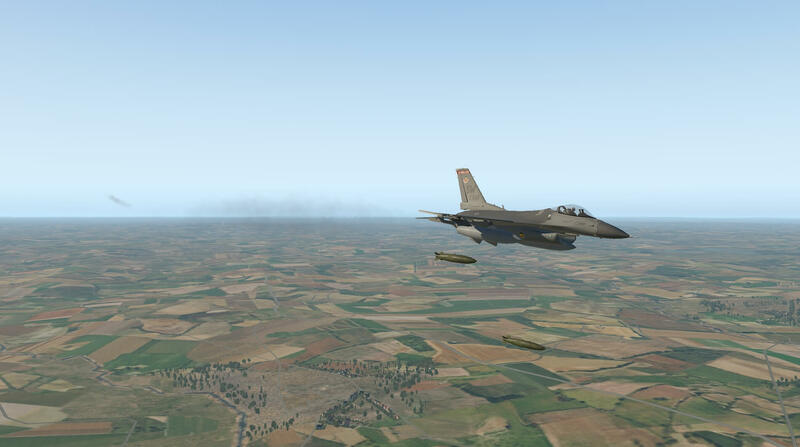 In terms of the weapons systems themselves the aircraft can be loaded with gun only, three external fuel tanks, air to air weapons and air to ground equipment. 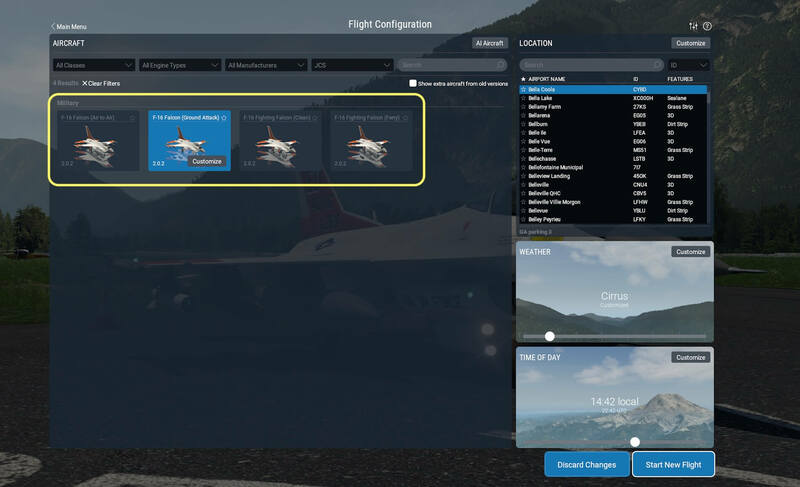 These variants can be loaded from the flight configuration screen in X-Plane. 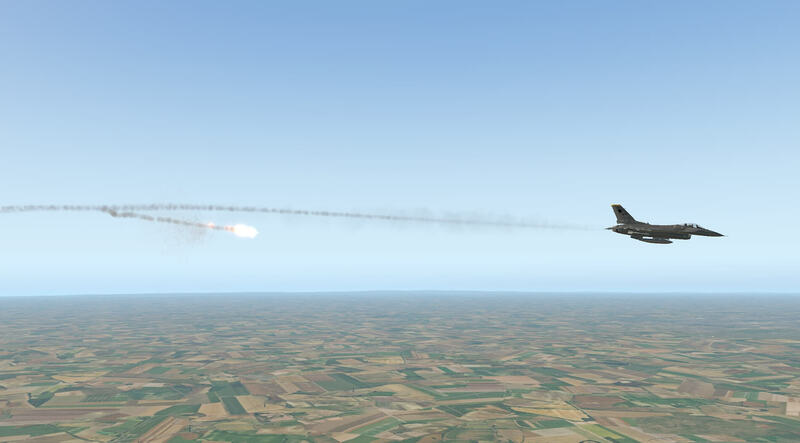 As well as the weapons themselves being modelled to fire, although without any aiming system, the wing drop tanks can be released by a separate button modelled in the cockpit. An additional piece of equipment modelled to operate is the chaff and flare dispenser. 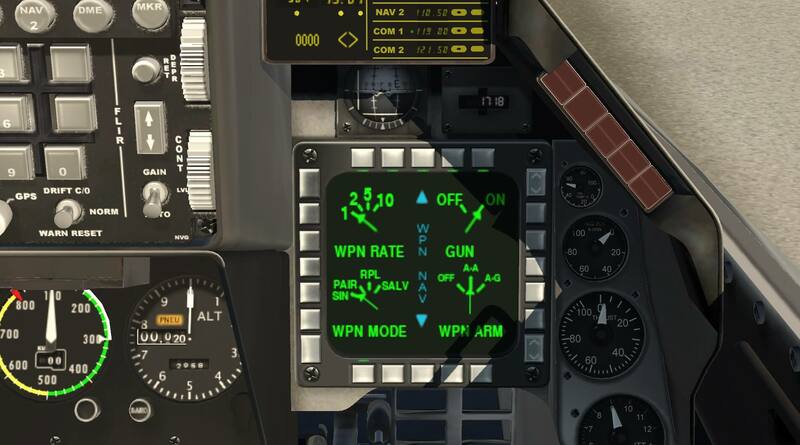 The manual states that pushing the appropriate buttons in the cockpit will activate this. 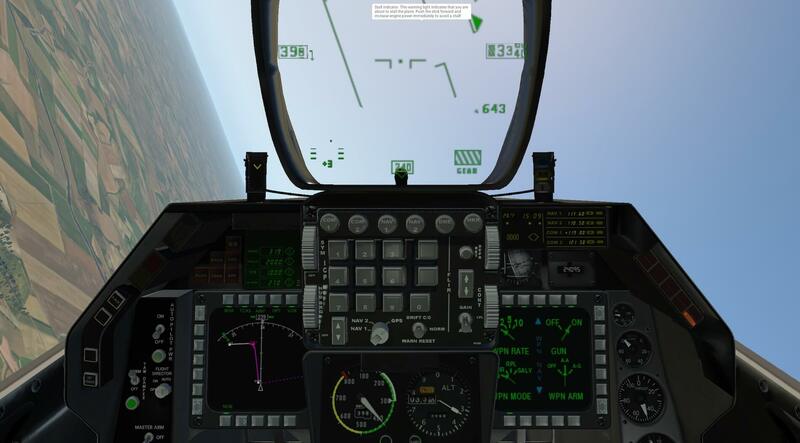 At the time I reviewed the model the buttons did not operate, even when the cursor changed to the action hand symbol when hovered over them, but after contact with the developers, and their prompt action, the chaff and flares could be released by assigning a button or keyboard key to each action. 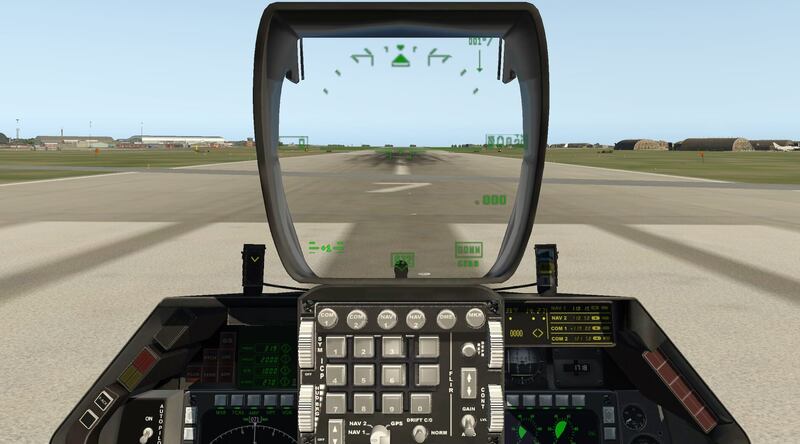 The aircraft has an operating auto pilot operated by switches and displays to the upper left of the instrument panel. As I have mentioned this autopilot is in keeping with most military equipment in that it cannot be controlled via the flight management system. The autopilot can be controlled by Nav 1, Nav 2 or GPS receivers or a combination during a flight. The controls allow for the autopilot to fly to a set altitude level, engage with an ILS system, lock on to a glide slope and localiser, maintain pitch or follow settings for automatic throttle, altitude, heading and airspeed. 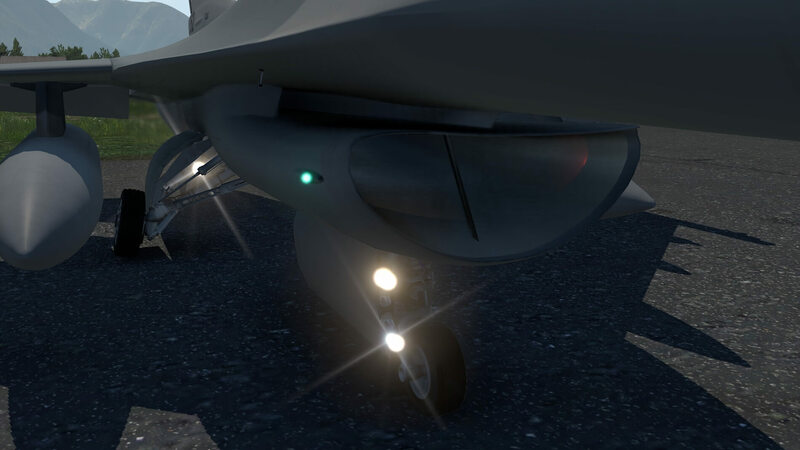 The aircraft can be flown with or without the autopilot by using the autopilot power switch. The model has a comprehensive communications system allowing Com 1, Com 2 and Nav1, Nav 2 to be set. 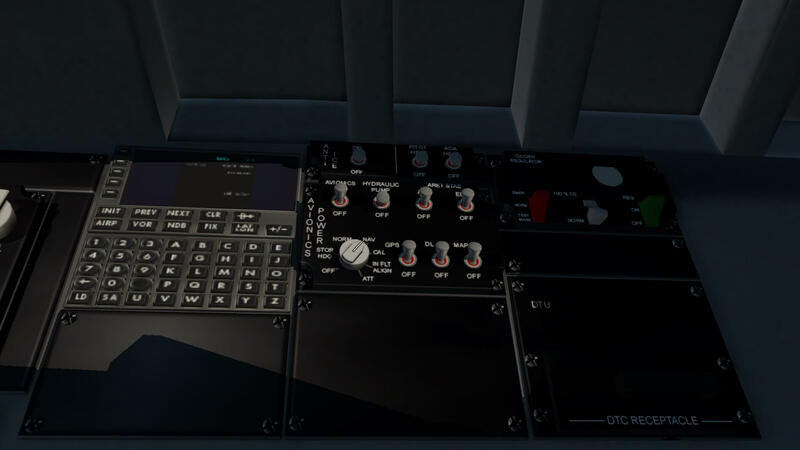 The radios allow for the selection of which radio receiver can be heard in the cockpit, the use of Distance Measuring Equipment and the set up of a transponder. This is explained in the aircraft manual. The model has an operating air to air refuelling system. The aircraft has a boom receptacle in the fuselage to the rear left of the canopy and this has to be opened via a button in the cockpit and then the refuelling boom positioned to allow fuel flow. As always I am reminded of the skill of real pilots in carrying out this manoeuvre. The on board fuel system allows the pilot to switch between external and internal tanks and to manage fuel supply, something quite necessary in an aircraft which enjoys its fuel. I loaded the aircraft initially with engine on at the end of the runway. Increasing the throttle was accompanied by an appropriate increase in engine noise and once the brake was off the aircraft responded quickly to move down the runway. 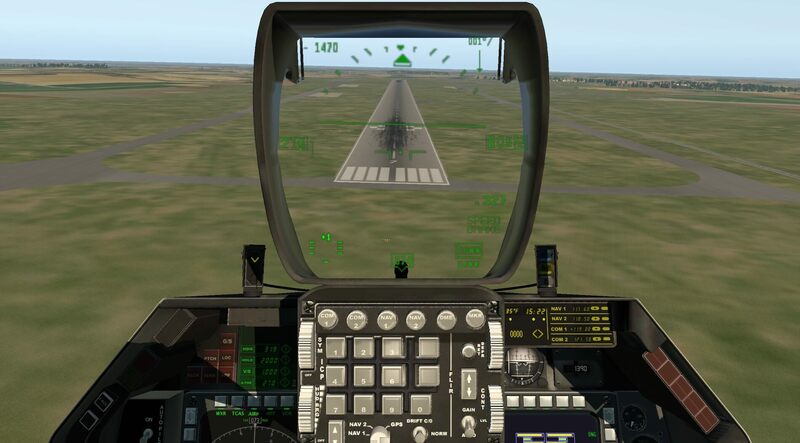 Immediately it was easy to see the responsiveness of the aircraft as a slight rudder input caused me to start weaving down the runway and common sense had me starting the flight again. I repeated the process, but this time with not such a heavy handed touch, and the aircraft rolled smoothly down the runway and could not wait to be airborne. This is designed to be a highly manoeuvrable aircraft and the model certainly delivers this. Pulling G causes the red mist to descend over the screen and it is very easy to induce this such is the nimbleness of the F16. I had to learn not to over control the model. 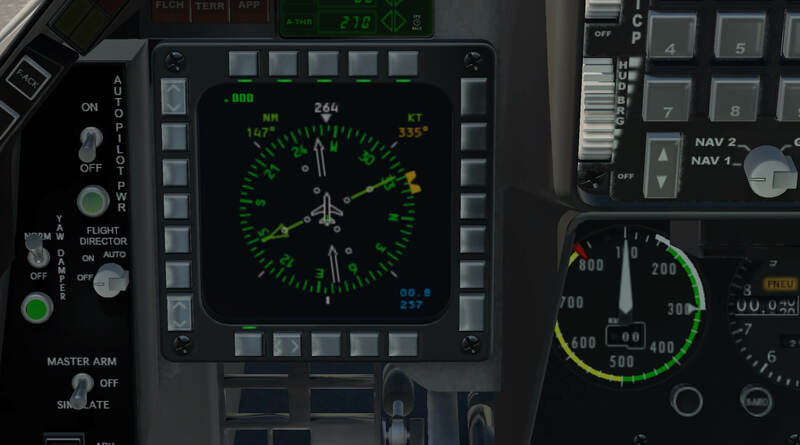 The dials and instruments respond quickly to the disposition of the aircraft and the information on the MFDs becomes more and more useful. The fuel information is very important as the levels drop quite quickly and its useful to keep an eye on which tank is supplying the engine. 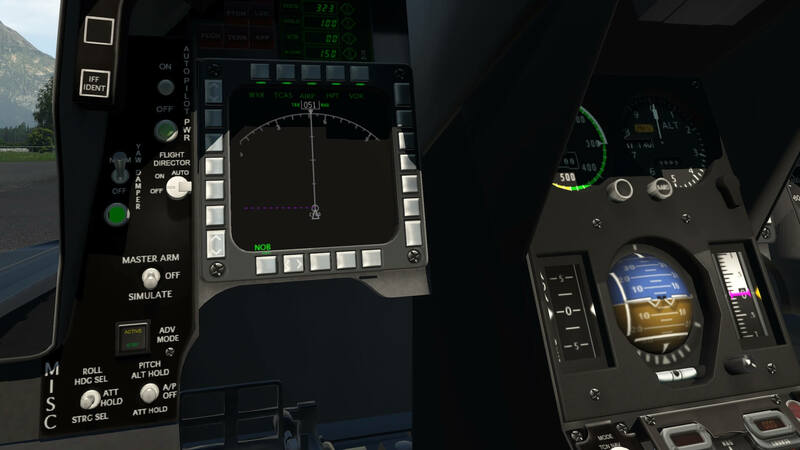 Visibility, as with the real thing, is very good from the cockpit and flight is very enjoyable. Returning to the airfield the visibility made lining up straight forward but I did not give enough account to the speed of this aircraft and had to go-round again as my approach speed was far too great. 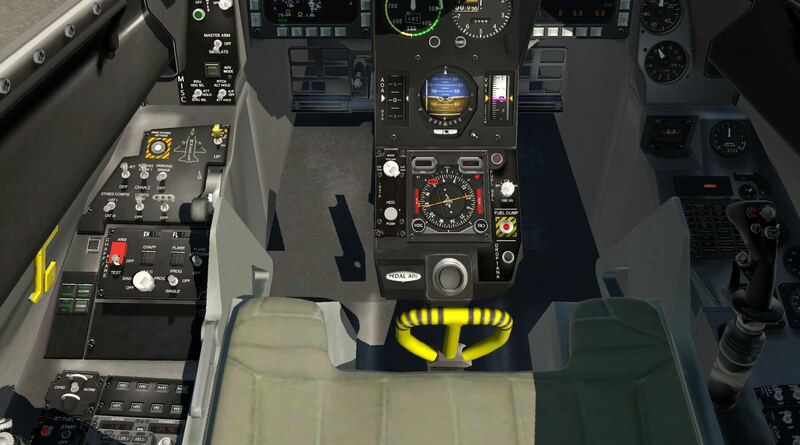 I completed the second approach with more caution and also used the speed brakes, the command for which I assigned to a joystick button. 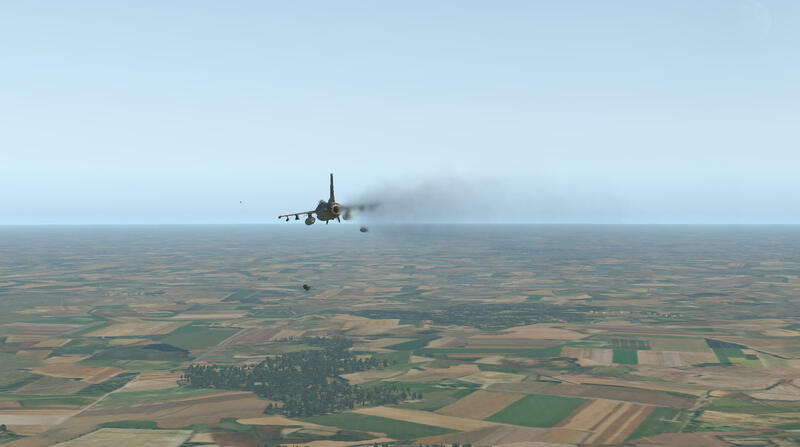 The speed brakes had the desired effect and I had a successful landing, though still rather quick. I am grateful to Angelique as she pointed me in the direction of a clip which illustrates the technique of combining speed brakes and aircraft pitch to create a combined braking effect and the travel down the runway on subsequent landings was more comfortable. This initial flight experience was great fun with a very agile, responsive and nimble model. Whilst the amount of systems modelled to work in the aircraft is not as great as some the key ones are available to make the flight interesting and enjoyable without being too complicated. I made several more short flights to try out the various systems that I mentioned earlier in the review. 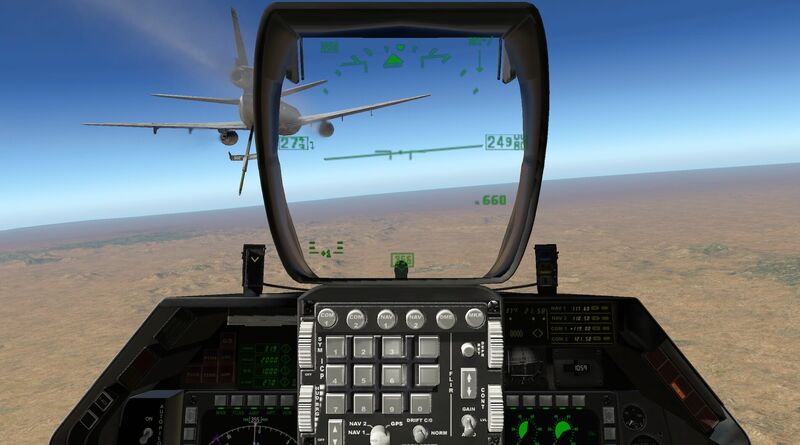 I used the air to air refuelling and in doing so I hovered over the switch to open the refuelling port. I found that the guidance text with this switch mentioned a drag chute which was strange as the switch was in the fuel panel and marked for air to air refuelling. I tried binding a drag chute command to a joystick button but no drag chute was modelled. I decided this was an error in labelling the refuelling port switch. I used the autopilot to fly on various headings and altitudes as well as using auto-throttle to control the aircraft. I used the approach system to fly an ILS landing and I found all of the various options easy to use and follow and responsive to my inputs. The use of the autopilot makes flight easier and smooth and gives the user the opportunity to gain a greater understanding of the information the aircraft is providing. The aircraft also has a terrain following setting for the autopilot and this makes for dramatic flying only just above ground level. This is a combat aircraft so it was always going to be interesting to see the weapons in action. I spent a little time understanding the settings on the weapons MFD and then used the different aircraft configurations to use the weapons. 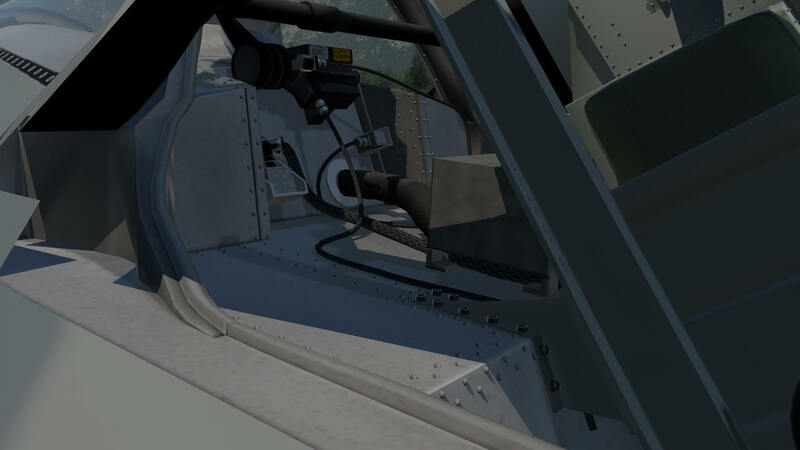 The gunfire was visible from the cockpit and the other munitions dropped away when I made the appropriate settings and associated joystick buttons. 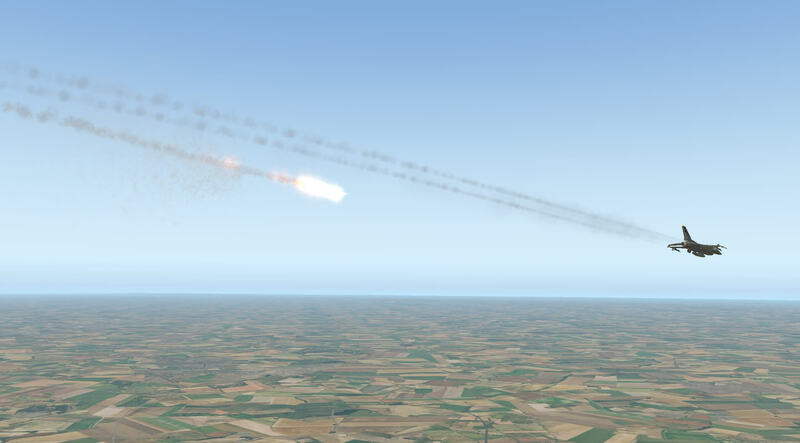 The weapons have no aiming system but look very realistic when leaving the aircraft. I also tried out the chaff and flare dispenser after the discussion with the developer which I mentioned earlier. Once I had assigned buttons to create the action the chaff and flares worked very well with the aircraft and looked very impressive. The switch to drop the wing tanks is modelled in the cockpit and this process is straight forward and works very well. 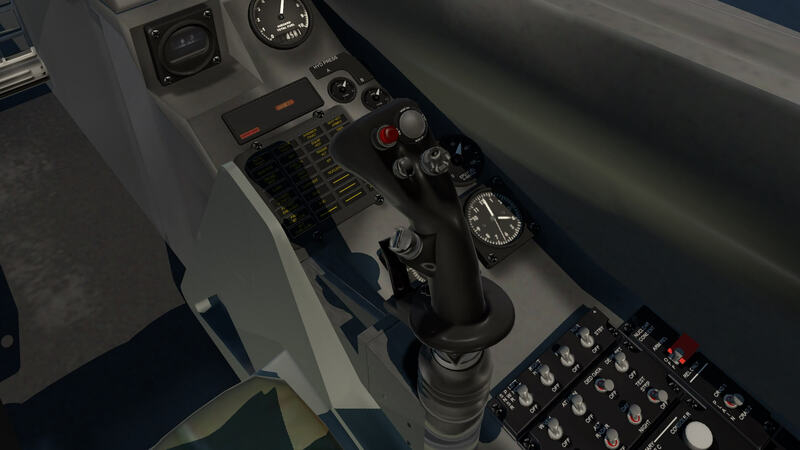 The manual guides the user through the engine start up procedure for the model and I therefore decided to carry out a flight from cold and dark. The aircraft start up procedure is quite brief and straight forward. I entered the aircraft, switched on the battery, avionics and hydraulic pump and then moved the engine start switch. During the process the sound package produced a hum from the avionics and the realistic sound of a jet engine winding up. 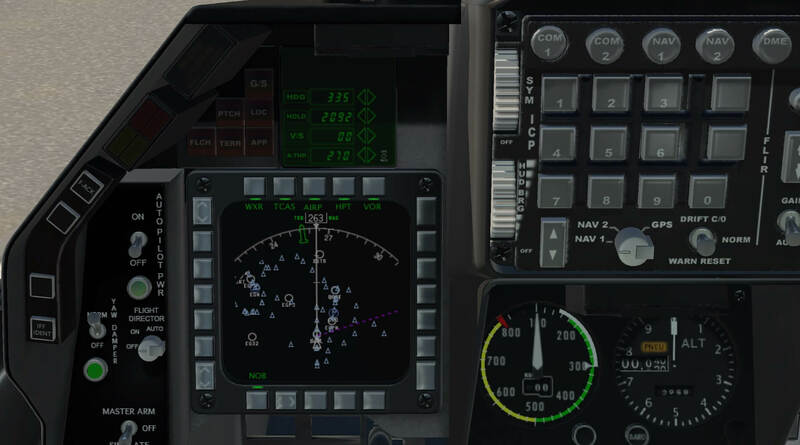 I entered a route plan into X-Plane FMS via Goodway and this appeared on the navigation MFD. 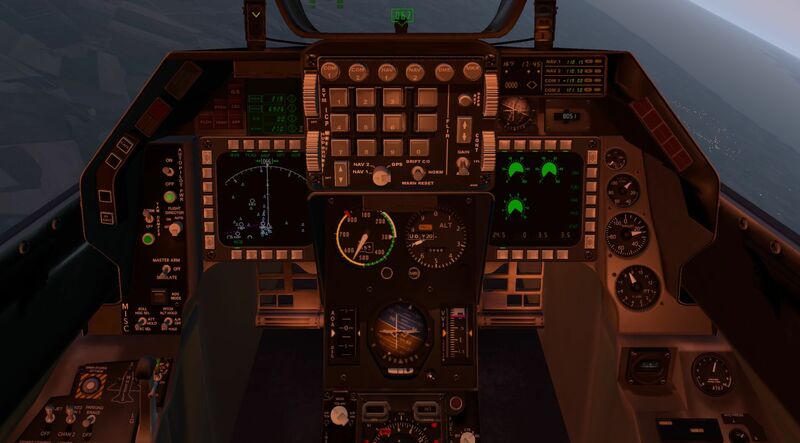 I then put the aircraft in to take off configuration by switching on the yaw damper, pitot heat, stabilisers along with the navigation lights, flash light and landing light. Bearing in mind the sensitivity to movement on the ground of the aircraft I taxied carefully to the runway. This becomes easier with practice and very gentle use of the throttle. 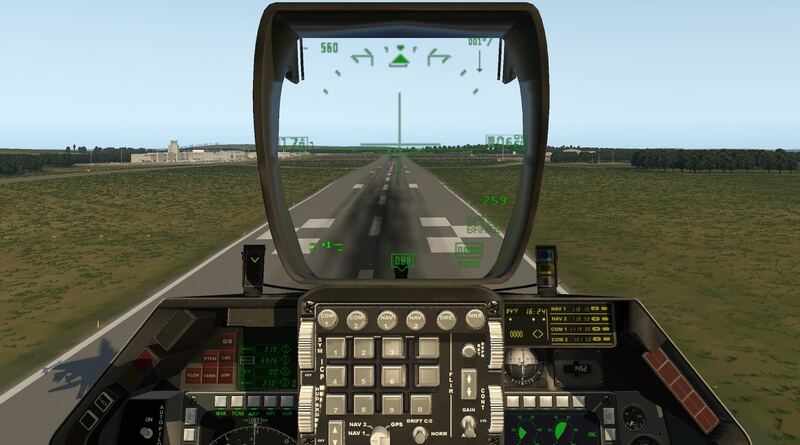 Having lined up with the runway I slowly increased the throttle and carried out a successful take off. Once airborne I retracted the undercarriage and was reassured by the sounds of the movement of the doors and wheels and this was confirmed by the undercarriage indicator lights. I manually flew to the desired track indicated on the route presented on the MFD. 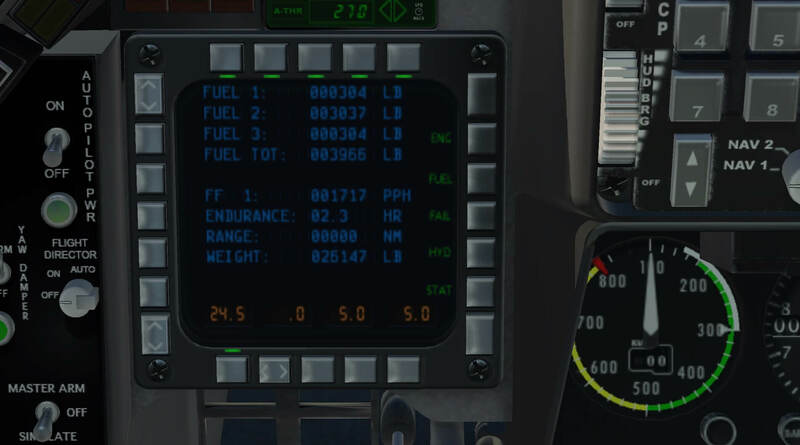 Once I had acquired the correct heading I used autopilot to maintain the heading and to climb to the desired flight level. 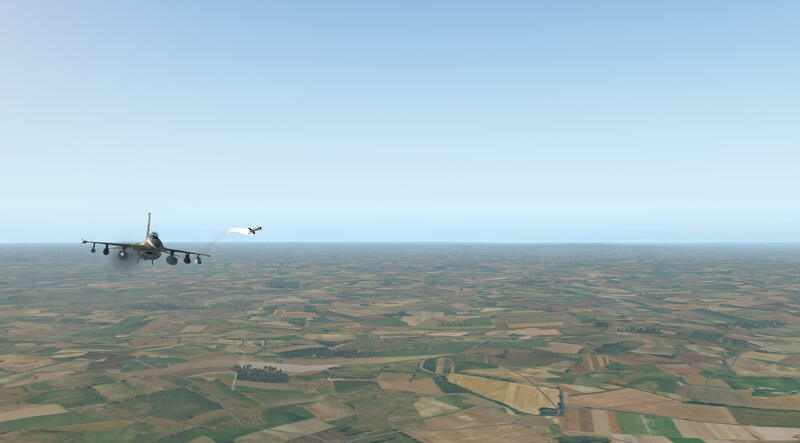 I manually changed heading at each waypoint then employed the various autopilot functions whilst I enjoyed the flight. During the flight I changed the time settings to find out how the model appeared in low light. 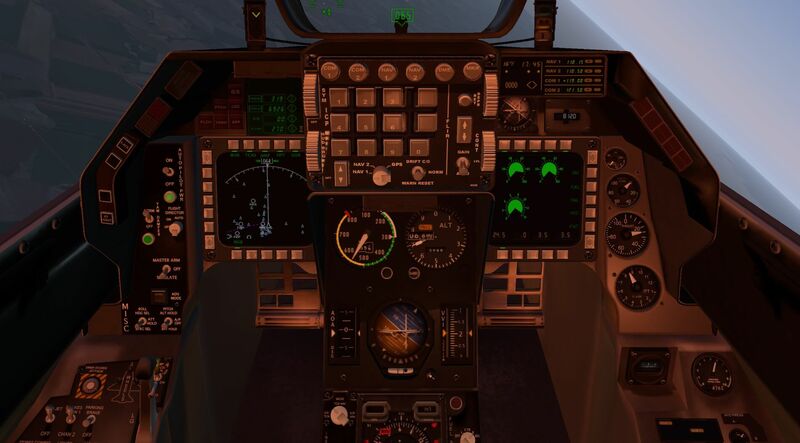 The cockpit lighting is good and instrumentation can easily be seen. 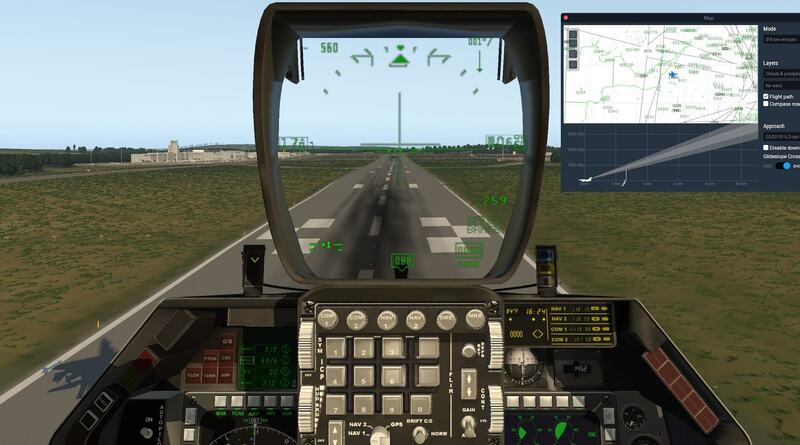 On approach to my destination airfield I used autopilot to make a smooth descent and lined up with the runway. 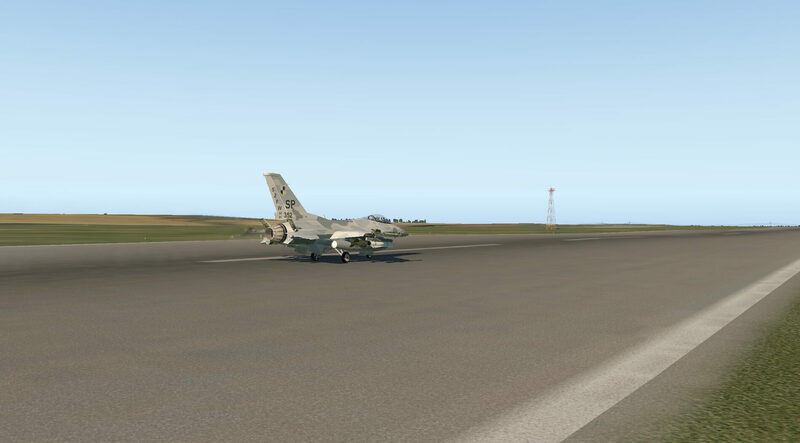 I carried out a manual landing and successfully stopped on the runway. I opened the canopy using the modelled levers inside and then taxied back to the apron. This was an enjoyable flight. 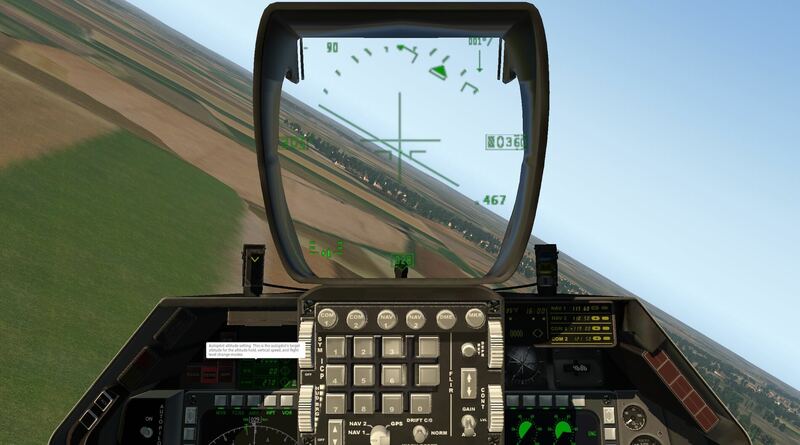 The model does not need as many inputs for systems as others as quite a few operate automatically in the aircraft and for some this may be a disadvantage in terms of realism but it does not detract from the enjoyment of using the aircraft. Flying remains a challenge as the aircraft is highly manoeuvrable and uses fuel quite greedily, true to the original. 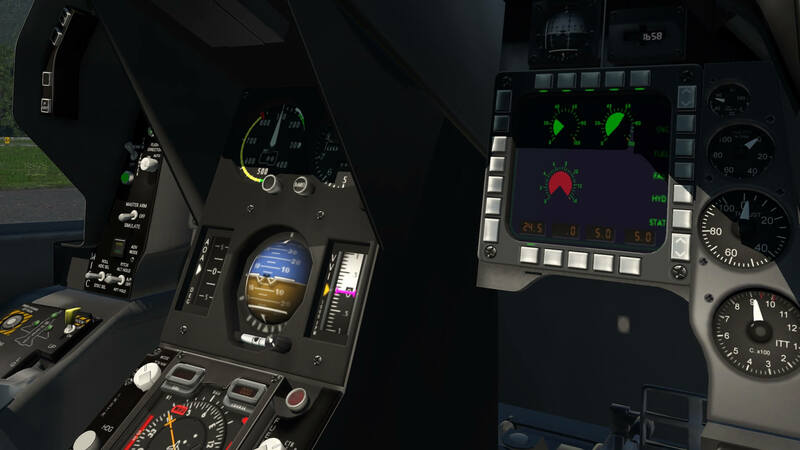 A great model to simply fly and whilst not as complicated as some it produces an immersive experience when using the systems that are modelled and using the aircraft as realistically as possible. 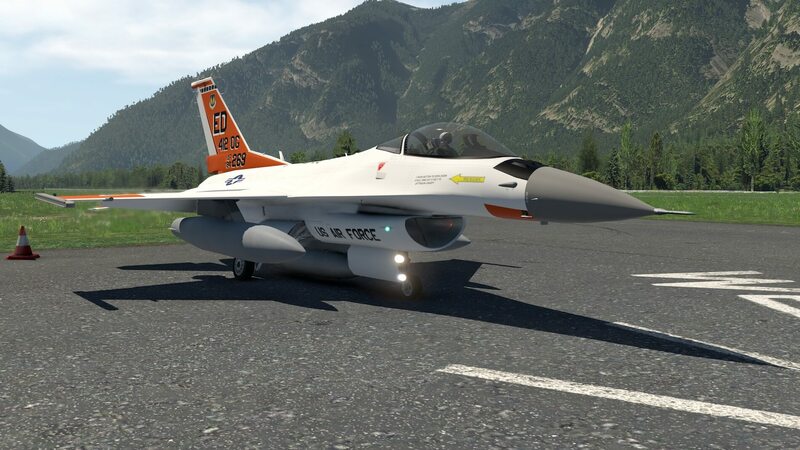 This model is not as detailed or as complicated as some and many systems work automatically, rather than having to be handled by the pilot, and whilst some may feel this limits the use of the aircraft it does free up the pilot to fly and enjoy the renown agility and responsiveness of the F16. 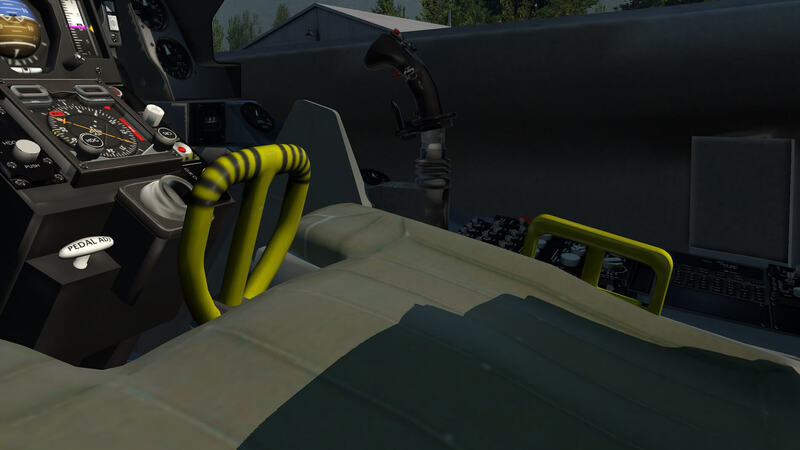 The developers have made key systems usable along with the additional functions such as refuelling and weapons release. 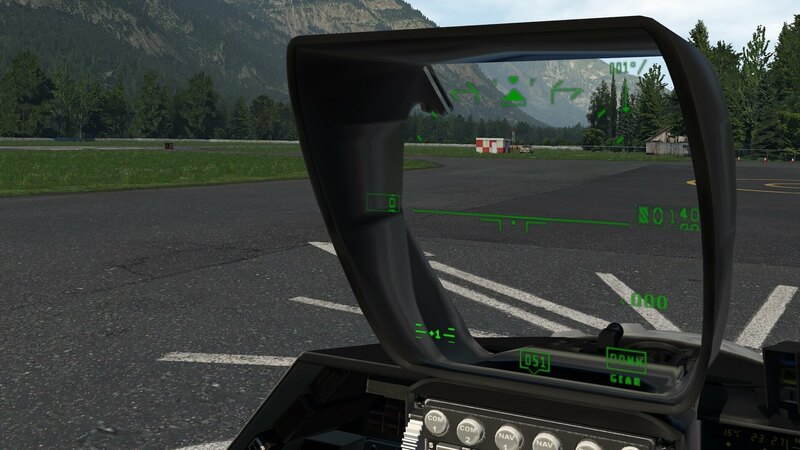 The streamlining of processes to start the aircraft and the straight forward methods of obtaining flight information from the various displays means the user can enjoy the flight experience itself and appreciate the all round visibility the model provides. The different configurations of the aircraft also add to a varied flight experience and create different issues for the pilot to manage. A throughly enjoyable model to use. More information can be found at the dedicated X-Plane.Org web page.